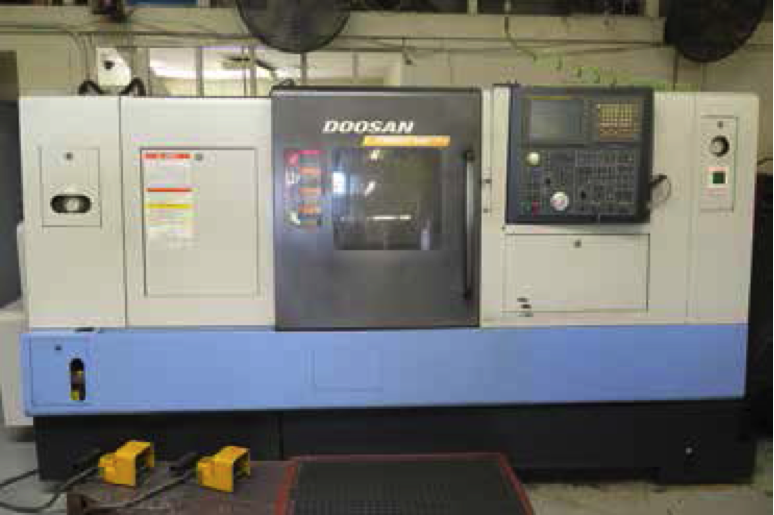 2007 Doosan PUMA 300C CNC Turning Center s/n PM302787 w/ Fanuc Series 21i-TB Controls, Tool Presetter, 12-Station Turret, Hydraulic Tailstock, 12” 3–Jaw Power Chuck, LNS Turbo Hinge Belt Chip Conveyor, 2007 Chip Blaster D30 High Volume Coolant and Filtration System s/n 9761. SNK SUT-10 CNC Turning Center s/n 9630272 w/ Fanuc Series 21-T Controls, 40-4000 RPM, 2.59” Thru Spindle Bore, 12-Station Turret, Hydraulic Tailstock, 10” 3-Jaw Power Chuck, Coolant. Hitachi Seiki HITEC-TURN 20 SII mdl. HT20SII CNC Turning Center s/n HTS21288 w/ Hitachi Seiki Controls, Tool Presetter, 10-Station Turret, KV-40 Taper Turret Tooling, Parts Catcher, 8” 3-Jaw Power Chuck, Chip Conveyor, Coolant. Hitachi Seiki HITEC-TURN 20 SII mdl. HT20SII Super Productive Turning Cell s/n HTS22452 w/ Hitachi Seiki Controls, Tool Presetter, 12-Station Turret, 8” 3-Jaw Power Chuck, Coolant. Fadal VMC6030 HT mdl. 907-1 CNC Vertical Machining Center (Factory Remanufactured in 2007) s/n 8801038 w/ Fadal CNC 88 Controls, 21-Station ATC, CAT-40 Taper Spindle, 10,000 RPM, 6” Extended “Z” Axis, 30” x 62 ½” Table, 30” x 54” Elevated Aluminum Top Plate, Coolant. 1998 Femtec / Kafo FV-50 CNC Vertical Machining Center s/n 014014 w/ Fanuc Series 0-M Controls, Hand Wheel, 24-Station Side Mount ATC, CAT-50 Taper Spindle, 3500 RPM, 21½” x 51” Table, Coolant. DoAll “Continental Series” mdl. DC-280NC 11” Automatic Hydraulic Horizontal Band Saw s/n 0300282 w/ DoAll PLC Controls, Hydraulic Clamping and Feeds, Chip Auger, Conveyors, Coolant. Lagun FTV-2 Vertical Mill s/n 18555 w/ Anilam Wizard 150 Plus DRO, 2Hp Motor, 58-4200 Dial Change RPM, Power Feed, 9” x 48” Table, Coolant. 2013 Sunnen ML-2000 DF Precision Automatic Honing Machine s/n 4M1-1554 w/ Sunnen Controls, 200-3000 Adjustable RPM, Power Stroke, ASC Size Control, Coolant. Sunnen mdl. MBC-1804 Precision Honing Machine s/n 85786 w/ Power Stroke, Coolant. Sunnen mdl. MBB-1650 Precision Honing Machine s/n 50697 w/ Coolant. Myford Automatic Hydraulic Tool and Cutter Grinder s/n HP93075FP w/ Wheel Spark-Out Controls, Motorized Work Head, Center, 4 ¼” x 28” Pivoting Table, Coolant. Makino C-40 Tool and Cutter Grinder s/n E48-5962 w/ Compound Grinding Head, 5 3/8” x 37” Pivoting Table, Centers. Ingersoll Rand DXR100 Refrigerated Air Dryer s/n 98MDXR4453. Honing Mandrels, Stones and Truing Sleeves. Lista 13-Drawer Tooling Cabinet w/ Hardware. 12-Drawer and 7-Drawer Tooling Cabinets w/ Misc. Jones &amp; Lamson 10” Table Model Optical Comparator s/n E-32624. 54” x 108” x 12” 4-Ledge Granite Surface Plate w/ Stand.